Messianic Rabbi Glenn David Blank has served as the congregational leader of Beit Simcha (beitsimcha.org) since it began in 1992. He also serves as conference chair and member of the Tikkun America Apostolic Team (tikkunAmerica.org) and as Literary Editor for the Tree of Life Bible (tlvbible.com). 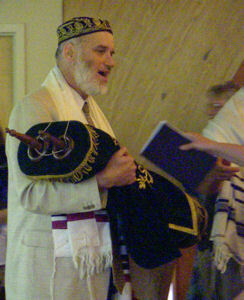 His ordination as Messianic Rabbi is from the International Association of Messianic Congregations and Synagogues (iamcs.org). Dr. Blank received his Ph.D. in Cognitive Science and M.S. in Computer Science from the University of Wisconsin-Madison, his M. A. degree in English from the University of Michigan, and his B.A. degree in English from Penn State University. After 27 years, he retired as a Professor Emeritus from Lehigh University in 2011 in order to pursue full time ministry. Glenn has been married to Pamela since 1982 and they have two children and one grandchild, all of whom are actively involved in Beit Simcha. If you’d like to meet Rabbi Glenn, feel free to contact us.